Both relief prints are done on mulberry paper, size 24×35.5″ (printed area), limited edition 1/50 each. These prints really were kind of difficult for me to print on my press because of the size and details. I wasn’t considering the size of my printing press when designing such large scale prints. They do fit on the printing press bed but the paper which has to be somehow larger than the print barely fit onto it which made it really difficult to handle everything. Besides it was challenging to get the paper that I wanted because most papers come in smaller sizes. I ended up cutting the sizes I needed from a paper roll. I still was limited to certain papers with barely any color choices. After printing a few test prints I ended up with a natural colored paper. 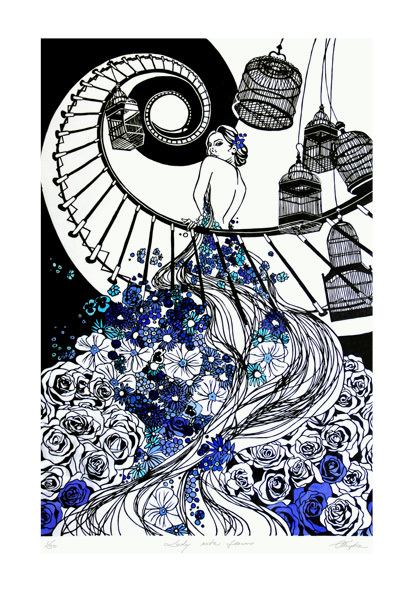 Each print is manually worked on with either silver and blue or gold and red acrylics and watercolors. Because I do work a little messy around all the ink (unfortunately) I do cover up all negative space (larger areas) on my lino cut with precisely cut tracing paper which keeps the paper clean from extra ink that’s not supposed to be there. Probably not the way to work but it helps me a lot. 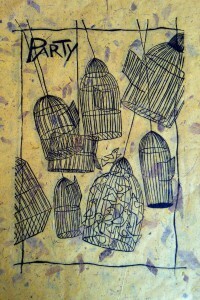 I cannot really explain how I came up with the images but I was intrigued with bird cages and flowers. 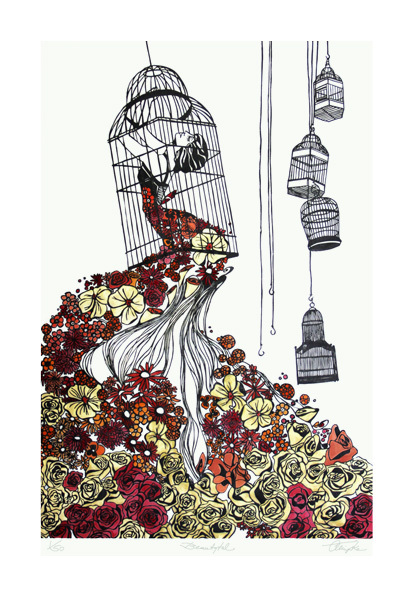 The first print was the caged woman with a flower dress (gold/ silver). My idea behind it was to make the woman and her outfit really beautiful comparable to an exotic beautiful bird that would be hold in a cage. The additional cages were added to fill up the negative space without taking the focus off the woman. As soon as I was done creating this image I wanted something similar for another print. I came up with the lady on the staircase. To tie it to my first print I added the flower dress as well. Both the staircase as well as the cages are simply structured lineal designs which I wanted as a contrast to the ‘busy’ organic shapes of the flowers. Even though right now I would say “never again such a large scale print” I am really pleased with the results and maybe after finishing the full two editions I am experienced enough to go for another large design – maybe…. This entry was posted in Illustration on September 29, 2014 by admin. “little feet on the beach” is a limited edition 1/100 relief print (lino cut), size 10×23″ (just the printed area). I printed it on sand colored paper that has a really coarse texture to it. This paper was the closest I could find that would remind me of real sand. But unfortunately it’s the worst paper to print on too. After each print the inked image had to be worked on because lots of paper fibers got stuck to the lino plate and therefore would miss on the printed image. I went back while the print was still wet and worked the missing areas slowly and very precisely back in. The image shows three pair of feet of a two year old – my daughter Lily Blu. The flip-flop pair is worn the wrong way but that’s just how she likes it or rather how she puts them on. This entry was posted in Illustration on September 28, 2014 by admin. Another relief print (lino cut) done on jade colored “Lama Lokta paper”, limited edition 1/100, size 8.5×24.5″ (just the printed area). The jade color is just perfect for underwater images. I added some silver acrylics to accentuate the reflections of the water and fish. Besides it gives it some little extra to break up the somehow dark green/ black image. It’s framed with silver and black mat board. It seems like I always come back to mermaid images (a few paintings and another relief print). The relief print (lino cut) is done on jade colored ‘Lama Lokta paper’, size 16.5×16″ (just the printed area). It’s a limited edition of 1/100. After printing the image I added partially some silver acrylic paint. I thought this would add some shine like the reflection or the shadow of a fish underwater. 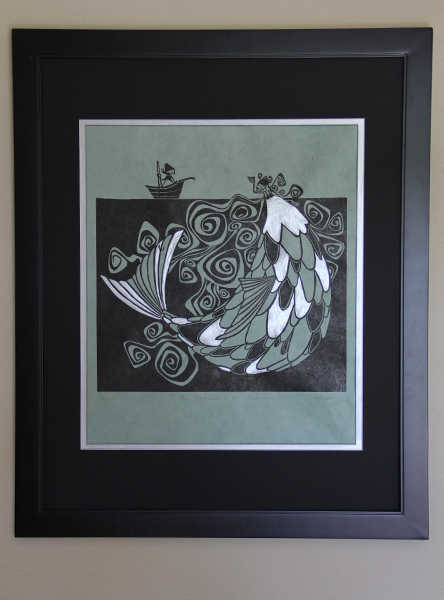 The print is framed with silver and black mat board. This entry was posted in Illustration on September 27, 2014 by admin. 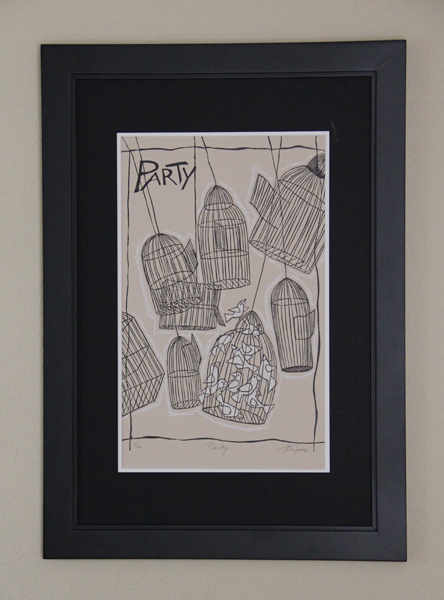 My “Party” relief print is printed on “fawn” colored stonehenge paper and manually worked on with white colored pencil. It’s about 11×17 in size (printed area). This was my first try and it did not look at all the way I wanted it to. 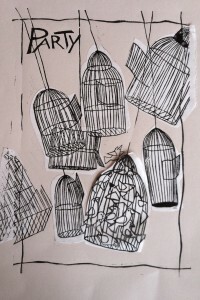 I placed white mulberry paper “behind” each cage. In order to keep it in place I used spray adhesive during the printing process which probably wasn’t my best idea because it was all over the place. As soon as I got it on my hands printing just got messy. It was a good experience even though it was really frustrating too. I probably will never use again spray adhesive for this kind of work! Again – not what I expected it to look like. 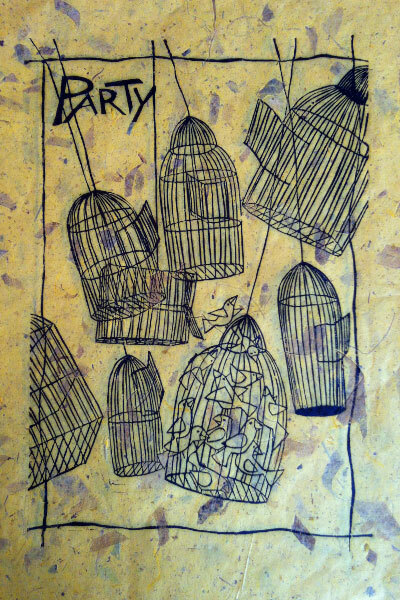 There was way too much going on with the pattern of the paper and all the detailed cages. The birds were hardly visible and the yellow didn’t do anything for the print at all. That’s when I started printing on natural colored paper. The result was o.k but somehow boring. It needed something added without making it too busy. I tried the white colored pencil and liked it right away. Framed with white and black mat board helps to accentuate the white line work. This entry was posted in Illustration on September 23, 2014 by admin. I have been busy printing and finally got to frame a few of my few of my new prints as well. 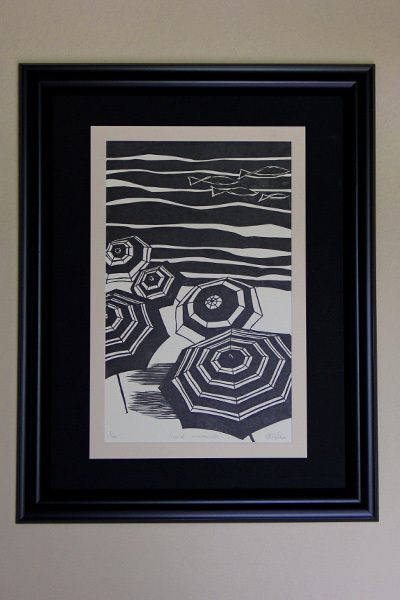 This is a relief print “Beach Parasols” on “natural” colored stonehenge paper, size 11.25×18″ ( just the printed area). I got the idea for the image sitting in a local beach bar looking over the beach. There weren’t actually as many parasols up but a few and I didn’t really see any fish but know that there is plenty out there. The image is pretty ‘clean’ and simple to keep the focus on the pattern. I tried different colors for the paper but came back to a natural tone to enhance the contrast of black ink on a light colored background.